This took place at Castlefield Gallery and Hulme Community Garden Centre on Saturday 24th November. The title swung back and forth between Radical Mycology Gathering 1 and Mycorrhizal Gathering 1 before settling on the mycorrhizal – I let the Radical Mycology people in the US know that it was happening and asked for some advice but never heard anything back, and it felt a little uncomfortable to use the name – something I came to regret, as it’s a lot easier and more explanatory to call it Radical Mycology Gathering 1, but hey ho. 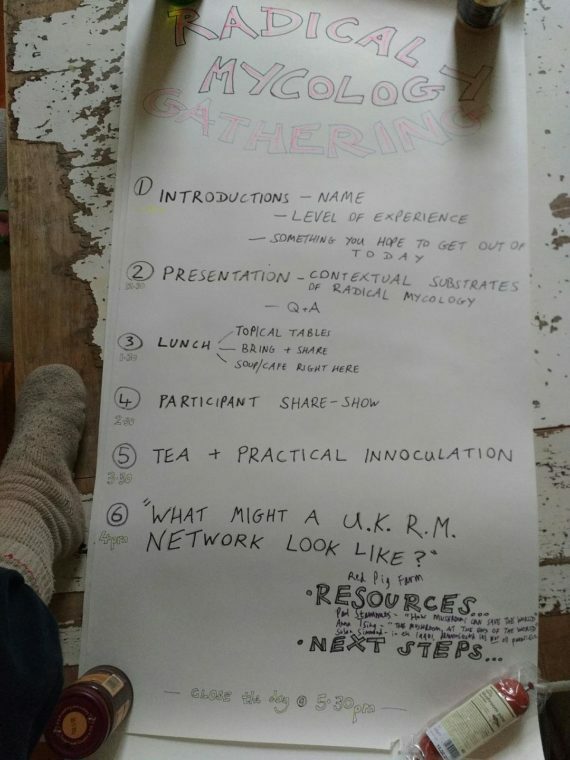 Below are the notes put together after the gathering by myself and the facilitator, the very excellent Jed Picksley, resident of Earthworm Housing Co-op should you wish to engage her for facilitation, compassionate communication training, anything to do with co-ops and a whole host of other skills. This gathering brings together artists, mycologists, activists, growers, and others interested in fungi for an exchange of practical knowledge and connective ideas. It is especially aimed at those who might be interested in starting a UK node of the ‘Radical Mycology’ network. Radical Mycology radicalmycology.com/ is a grassroots movement and social philosophy based on teaching the importance of working with mushrooms and other fungi for personal, societal, and ecological resilience. It differs from classical mycology in that, rather than focusing on taxonomy, identification, study and mycophagy (eating mushrooms), Radical Mycology works to build relationships between humans and fungi for the benefit of larger communities and the wider world. A classic example of a resilient system in nature are the mycorrhizal (fungus-root) mutual aid associations. 95% of plants form with subsoil fungi, in which the plants exchange starches for water, minerals and other benefits such as deterring predators, breaking down rock into soil and filtering out heavy metals. The fossil record indicates that mycorrhizal fungi were key to the transition of plants from water to land 400 million years ago. In nature, it is survival of the most co-operative as much as it survival of the fittest (and don’t let Jordan Peterson tell you otherwise). Studying the interdependence of plants and fungi provides a useful counter to the neoliberal paradigm which claims that it is “natural” for individuals to act as rational agents motivated only by self-interest. flesh into earth into flesh. ful of dirt, this poetry. The day started in Castlefield Gallery with a tour of the exhibition The Ground Beneath Your Feet where Keep It Complex, myself, Omid Asadi and other artists combine to create a complex web of response to current and timeless issues, standing together in confident defiance of the “simplistic lies” that forces wanting to divide, reduce, disempower, and disconnect us from each other, nature, and visions of a better world with productive alliances between human and non-human forces. From there we moved to Hulme Garden Centre where we spent the rest of the day going into Radical Mycology. 1. Introducing each other, we learnt that artists, activists, mushroom growers, mushroom enthusiasts and the mushroom-curious were all present! – their fruiting bodies; the mushrooms we see above ground, are comparable to the apples on an apple tree. The ‘bark’, ‘roots’ and ‘branches’ being unseen, but much larger, and present for much longer. – the fruiting body produces numerous spores sometimes 30 billion spores a day! – some the fruiting bodies eject spores, explosively. 20-thousand-G-force expulsions are not uncommon! 2. James Scrivens from Coed Tanylan started us off with an overview of his life in fungus and of Radical Mycology, which I’m hoping he will work up into an article for the zine we are going to put together! He started with a beautiful poetic account of Radical Mycology which contained the phrase Spores of Liberation, and pointed out that 10% of our enteric (gut) biome is fungi. And told us how Peter McCoy started Radical Mycology in the US in 2006, as a path to partnering with fungi. Think like fungi! In short the US Radical Mycology network seeks to work with fungi, apply fungi, promote fungi, communicate insights from the fungal world to humans and, most importantly, encourage humans to learn from interacting with fungi. In the US there is an annual convergence with workshops on mushrooms as fibre, dyes, paper, pigments and medicine as well as food and inspiration, and there is a report on the 2018 convergence on the Radical Mycology homepage. Humans are more closely related to fungi than to plants; our common ancestor branched off a paltry 800 million years ago. There are 6 million species of fungi – nearly half of all species on Earth – and only 2% have been classified; and only 100 have been integrated with humans, as food, medicine or other function. Ganoderma – reishi – can produce 30 billion spores a day!!! Spores can be ejected at a force of 20,000G – they are the fastest thing on Earth. Panspermia is the idea that life may have originated from intergalactic spores. In the fungal world there can be thousands of mating types – gender is complicated! Fungus grow from the beautifully-named Spitzencorpe – the growing tip – which is constantly dissolving and being rebuilt. The hyphae exert huge pressure and can grow through hard things like tarmac. The hyphae form hyphal knots which fill with water and form fruit – the mushroom. 90% of plants have mycorrhizal associations; some plants, such as orchids, can’t germinate without mycorrhizal fungi. Mycorrhiza can be divided into ectomycorrhizal (where the fungal hyphae form a lattice between their host’s epidermal and cortical root cells known as the Hartig net) and endomycrrhizae (where the hyphae penetrate the roots). Ectomycorrhizal fungi (which come from the phyla Basidiomycota, Ascomycota, and Zygomycota) form associations with around 2% of plant species, typically woody plants, and tend to specialise – ie the fungus will only grown in association with particular plants. Endomycorrhizae come in three types – arbuscular mycorrhizae (from the phylum Glomeromycota), ericoid mycorrhizae (phylum Ascomycota) and arbutoid mycorrhizae (phylum Basidiomycota) – and form associations with 80% of plant species, including most food crops, grasses, herbs and trees such as apple, cherry, maple and juniper. Jane got James to say more about the phylum glomeromycota which has large spores which the fungi shed underground. One of the reasons they are so large is that they contain 300-85,000 [?? ?my notes just say thousands – JL] of different genetic nuclei. They exude a substance called glomalin which is sticky and helps soil to aggregate; it helps the soil become a better carbon sink, because it is itself a predominantly carbon-based substance. This species actually defies the concept of biological species as it seems to have no isolated DNA. – “culturing from the leading edge”; growing from the new tips rather than an old centre; like society growing from schools or new university departments rather than growing from the staid old houses of parliament in Westminster! – appreciating that soil is primary and fungus and humans can collaborate to improve it. Alex Hamer spoke for five minutes in soil ecology and remote sensing; predicting what life will be in the soil by measuring and identifying the plants using satellites, planes, drones and spectrometers (or, not having to disturb the earth). In a satellite photo, one pixel can represent 10 x 10 metres. Her PhD is in soil biodiversity, linking fungi and bacteria to plant traits and looking at the carbon an nitrogen cycles. Miranda, Sophie and Leonie spoke about the Callis Community Allotment/garden, and their Mushroom Club. Mushroom Club is making an evening of it, someone sharing some research they’ve done on a particular mushroom, eating some, maybe inoculating a substrate or making tinctures together. Focusing on a particular mushroom each time, you’ll never run out of learning together! Marc Hudson had us do an exercise called “the skills and knowledge in the room“, demonstrating that any room full of people knows a lot, and any group can increase its resilience by deliberately sharing the skills that will help it to carry out its functions as a group, or just help people to reap more learning benefits from each other by explicitly asking for advice about things we might want to learn. Colin told us about the origins of his Mushroom Spotters Facebook mushroom group, which has just two rules: Keep it friendly, and keep it mushroom! The group grew out of a desire to have a Facebook group with “no politics”, for people who initially met through anti-fracking activity. Foraging works all year round, in woods or fields of many sorts. A book that Colin recommends for getting started with foraging, is “River Cottage Mushrooms” by John Wright. It is not a recipe book, but a foraging guide. It stars 50 easy-to-forage mushroom, and includes the ones-you-might-mistake-those-for, and has just a few recipes at the end, but is more about the joy of getting out and searching around. Right now (the start of winter) we could be finding velvet shanks (the cultivated form is known as enoki) for an immuno-boost. Colin’s top mushrooms are Turkey Tail all year round, and the hardest-to-mistake-for-anything-else, “Scarlett Elf Cup”, so safe because it’s edible, and easy to identify. I gave a swift account of myco-remediation – the use of fungus to clean up toxins. Oyster mushrooms are particularly adept at this, being able to convert hydrocarbons such as diesel into water and sugars, clean up E. coli and bioaccumulate heavy metals. See https://www.ted.com/talks/paul_stamets_on_6_ways_mushrooms_can_save_the_world for more info. – eat mushrooms and seaweed every day; seaweed contains omega 3. On the eating mushrooms front, putting mushrooms gills-up in the sun for 6 hours before eating (or drying, and eating later) massively increases the amount of D vitamins. She particularly recommended shiitake, black trumpet, horn of plenty and golden chanterelles. Shiitake especially has lots of D vitamins and B12. One of the reasons fibre is so essential, is that it feeds the micro-organisms in our stomachs, which then release – for us – hard-to-get nutrients. We should aim for 35 fibre per day. Long-chain polysaccharides are good for gut bacteria. Our guts are important, as 80% of our serotonin comes from our gut. Paul Stamets “psilocybin and the mycology of consciousness”. January Radical Mycology Gathering 1.5 – practical and social day out at Callis Community Allotment. February 16th, 1-4 pm Radical Mycology Gathering 2 at The Bluecoat Gallery, Liverpool – everyone to bring a contribution to the What Is Radical Mycology zine. March Red Pig Farm “Coed Talylan”, Wales. James invites us and other volunteers to come and stay on his land in Wales, for anything over a week, and help inoculate 1000 logs with Turkey Tail mushrooms. 12 people can be cosilly hosted at any one time at Red Pig Farm. Summer 2019 – Radical Mycology gathering? For 40-50 people? September 2019 – Fungus Festival in Bolton. Read “The mushroom at the end of the world” by Anna Tsing and reconvene at Islington Mill to talk about it in April maybe. A weekend afternoon slot preferred, Jane to lead conferring and arranging. 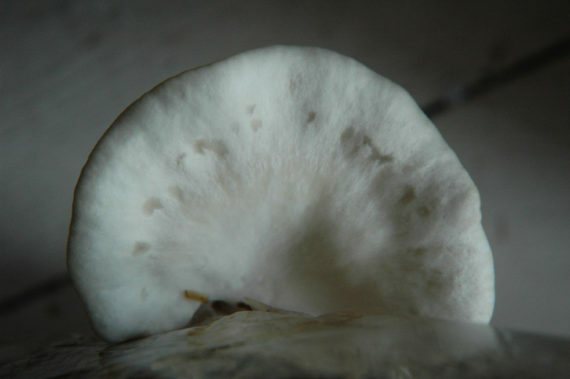 A newsletter/zine working group on What Is Radical Mycology? : Jane, Matthew, Esme, Lauren, James and Alex. We want your photos and stories about how your thinking continued after the 24th November, with your inoculated cardboard burrito! A new Radical Mycology UK Facebook group. James has created this – you can join at https://www.facebook.com/Radical-Mycology-UK-293608777937510/. Invitation to join Colin’s Facebook group Mushroom Spotters UK https://www.facebook.com/groups/1162989313716416/ . – Visit Preston New Road with mushroom soup! Excitingly, Colin is doing a forest school course with a group of artists at Islington Mill, and the Mill is also talking about setting up a community garden – which could go fungal! Jane and Esme are interested in this. James has made a blog post really spelling out what to do next with the cardboard burritos and the bags of straw – here it is! http://www.mycogeneration.co.uk/article/using-your-cardboard-spawn-with-straw/ – add comments to the page if you have any questions, thus making it into a handy and informative forum for all of us. The philosophy of Radical Mycology might inspire us to try to explore a new social media platform/application, that chimes more with our values than the monster-king Facebook. James will send a message round about the block-chain-technology-based new social media platform, which isn’t Facebook. Jed counters all this fungal love, with some facts about bacteria, the other champion kingdom of decay, connection and the transformation of nutrients. Particularly in the stomachs of the animals that graze very dry savannahs and deserts where there is no soil wet or old enough to cycle potassium and other nutrients making them available for plants. In these situations, the stomachs of those animals are crucial sites. So, now I’m trying to pull all the strands together – into some kind of hyphal knot. Or maybe not pull them together – but get an overview, see what the patterns are. I started this piece wanting to make a mycorrhizal artwork – with mushrooms – and my first vision was of a network of “villages” – settlements – made of towers of mushrooms, each with their own fairisle pattern. And these would be on/in a landscape of – earth? Sawdust? Straw? Somehow connected up. And some of the towers would be 4 metres tall. Yep that’d be great although logistically tricky – how do you transport a 4-metre-tall fungal tower? But also, this was outside-in thinking, jumping to the end point without doing the preliminary investigations. Usually when I make work it is my way of understanding more about a subject, whether that is the Earth’s climatic history, the development of the global financial system, the road to Brexit, or how Facebook advertising works. Plus I like making things, I love materials and the visual. Ideally but not always I can combine all that. So going back to the starting point, to the mycorrhizal fungus/plant mutual aid, required reading, talking to scientists, getting my head round the subsoil world – and at the same time, the requirements and timescale of growing mushrooms meant that I had to start experimenting with different varieties, early on, to see what could fruit in time for or during the exhibition. Not wanting to stick with oyster mushrooms, which aren’t mycorrhizal and which can even inhibit the growth of plants, although their decomposition of dead wood does give them a role in mutual benefit within woodlands. And obviously, with hindsight, everything took three times as long as expected; setting up multiple experiments, using different varieties and substrates, took till the end of September. Getting carried away with ideas – growing mushrooms so I could harvest the spores for using with tempera – a great idea but not for this project. Plus organising the Mycorrhizal Gathering – which may turn out to be the heart of this work and the most important outcome. Leaving – not enough time to immerse myself in understanding the mycorrhizal domain. But still some. So having this uncomfortable experience of weaving between immersion in a topic and immersion in the practicalities of growing, the excitement of fruiting, but not being able to give the fungus the attention it really deserved because god help me I set up 69 different growing experiments. But for process-based work all you can do is set up the initial conditions and respond to what transpires; when dealing with living actors, my control is limited. I can provide warmth, moisture, shelter, I can decide when to try and shock the fungus into the next stage of its growth cycle, but there are so many variables and there is the fungus itself, a living being with its own needs and responses to subtle changes in conditions. I can do my best and I can live with the uncertainty. However this was not initially envisaged as a process-based work, and that I think has been my weakness all along, or my omission. How could it not be process-based, and why didn’t I factor that in from the start? The varieties that are new to me – some of my trials are fruiting now, too early for the exhibition, which previews in a week, and too slow for me to grow more in time for the preview (although not too early to grow to restock during the exhibition’s 11-week run). The oysters I can be confident of having fruiting for the preview. Reasonably confident. So, mutual aid and process/uncertainty. Going back to the mycorrhizal, I’ve used a diagram from Soil bacterial networks are less stable underdrought than fungal networks, a paper co-written by the ecologist Richard Bardgett at Manchester University on the stability of soil bacterial and fungal networks under drought. Interestingly, one of the findings is that the bacterial networks’ stronger connections make it less stable, in that if one of the connection nodes is knocked out, the whole network is weakened. The fungal connections, being more dispersed, provide greater stability. A bit like the internet, but the bacterial/fungal contrast also makes me think of the role of key political organisers, and how they are a target in times of repression. Organising is not everyone’s cup of tea or talent, and an effective organiser is a good and rare thing. The diagram shows the strength of relationship between different parameters such as soil moisture, photosynthesis, the plant, bacterial and fungal communities, two genes involved in the nitrogen cycle, and nitrous oxide and carbon dioxide, two greenhouse gases given off by the action of soil micro-organisms. Backing out from the micro to the macro, from the subsoil to the above-ground realm, in search of a way to incorporate human mutual aid, I’ve mapped the structure of the UK Camps for Climate Action (2006 to 2010) onto the soil ecology diagram. The Climate Camps were volunteer-run, admittedly with some logistical support from NGOs, and mobilised large numbers of resources and people to take direct action against targets such as the proposed third runway at Heathrow airport and the building of a new coal-fired power station at Kingsnorth in Kent. One of the most important things they did was to put climate change onto the media agenda – for a few years, climate change was in people’s consciousness in a way that it hasn’t been since, as we slide towards and over the climate feedback precipice. The Camps were originally intended to be a starting point for local campaigns rather than an end in themselves; burnout and the strain of dealing with large-scale police response (and to an extent, the emotional toll on some key organisers of finding out that a trusted and influential participant was an undercover cop) meant that the last UK Camp for Climate Action took place in 2010; however since then there have been a series of Climate Camps globally, including one that gave rise to the successful land occupation against a proposed airport at La Zad in Brittany, and in the UK there has been a succession of camps as focuses for direct action against fracking and further coal extraction, the most recent being September 2018 in the Pont Valley in County Durham. I’ve added two elements to the diagram; the animal realm, which maps onto the Climate Camp Neighbourhoods (geographically themed camping areas so that people can camp with the people they’re likely to work with back home); and phosphorus, which is required for all known forms of life and alongside nitrogen is one of the key nutrients made available to plants by mycorrhizal fungi. Phosphorus could map onto the Facilitation working group – an essential but often unseen or uncomprehended function/group which provided the decision-making infrastructure for the camps, enabling them to function both logistically (in terms of the practical meetings and decisions needed to organise and run the camps) and politically (in terms of the meetings which made key decisions about targets, tactics and the political direction of the Camps). It’s inapt but tickles me to mention that phosphorus was first isolated by evaporating urine. Phosphorus is also used as a weapon. So far so semiliteral. While this gives me some satisfaction and structure, and some tools to think about the relationships between the different elements of the Climate Camp, the flows of energy and resources between Site and Gate, or Kitchens and Site, or Power and Legal Support, there is a range of more nebulous or inexact – neither of these is the right word – considerations and elements that are not yet satisfactorily integrated. An important question is – what are the mushrooms to me? In the past I incorporated (used?) oyster mushrooms as agents, detoxifying neoliberal texts. But detoxification isn’t what I’m looking at this time. The mycorrhizal fungi in this work are morels and a mycorrhizal preparation that I bought online. It turns out that morels aren’t able to fight off competitor moulds, and so two of my three morel growing trials succumbed to green mould and have been planted out in the garden. The third has been mixed in with compost and planted with an ash sapling, ash being one of the tree species that morels associate with. Morels belong to the Ascomycota, one of three of the seven fungi phyla that contain mycorrhizal fungi. Being Ascomycota, they disperse their spores by firing them out of little tubes (asco means flask). Morels are ectomycorrhizal, meaning that rather than penetrating their host’s cell walls their hyphae form a lattice between their host’s epidermal and cortical root cells, known as the Hartig net. Ectomycorrhizal fungi form associations with around 2% of plant species – typically woody plants, including species from the birch, dipterocarp, eucalyptus, myrtle, beech, oak, willow, pine and rose families. Ectomycorrhizal fungi include chanterelles, truffles, milkcaps, boletes, death caps and destroying angels. Ecosystems dominated by ectomycorrhizal plants contain 70% more carbon per unit of nitrogen than ecosystems dominated by endomycorrhizal plants; so far I haven’t been able to ascertain whether this is because ectomycorrhizal fungi are particularly good at sequestering carbon or other factors. If I’d made a truly mycorrhizal system for the gallery – well one thing I’ve learned in this research is that mycorrhizal associations don’t exist in isolation. Crashingly obvious once stated, but I started by considering them in that way. Mycorrhizal systems need all the rest of it – soil, water, micro-organisms, bacteria. So a truly mycorrhizal system would have incorporated all these elements, and also one thing I haven’t had enough of – time. It takes time for relationships to establish and grow; it takes a lot of time for a mycorrhizal fungus to establish and fruit – decades rather than weeks. The best I could do, in two months, was an approximation which contains some of the necessary elements – or, a starting point; who knows what my (? the) ash/morel combo will go on to do. If I’d started with a tight focus on the morels, and worked outwards, I’d have something different now. And the fungus might have been more of an actor, rather than a material. It’s hard to know where the line falls – all the fungus that I’ve inoculated seems to want to grow, it can all be said to be pursuing its own agenda of colonising, fruiting, dispersing spores. It can all be said to be inhabiting the larger realm of mutual aid – I’ve provided substrate, shelter, moisture, and the fungus provides me with food and medicine, an artwork, possibly some gifts. I didn’t start with a tight focus, but a dispersed one. Does this give me something differently good? For example, having set up some initial conditions – an intention for the work, growing multiple fungi, experimenting with knitted copper sheaths for the growing fungus – I can attempt to direct matters, but once the fungus is underway I can mainly pay attention and allow it to develop as it will. If I lose the fungus to green mould, if it starts to form fruit and then stops, if the fungus refuses my wants – that is how it is. Likewise, crudely put, the Camps were also an exercise in setting up the conditions for people to take direct action, the conditions that could lead to a mass movement against fossil fuel infrastructure – but once 2,000 people were on site, most of whom had had nothing to do with the development and direction of the Camp, their further actions couldn’t be controlled or monitored. It’s impossible to know everything that the Camps led to, all the knock-on effects and all the failures or counterproductive actions. So there’s something about letting go, but without abnegating responsibility. Letting go of desire for a particular outcome, while setting up the conditions as well as possible for that desired outcome – and being able to respond to events taking a different turn, rather than forcing them into a preplanned shape. No one at Drax Climate Camp in 2006 was thinking about impacts in Brittany in 2018, when the airport that La Zad prevented was finally cancelled, I am pretty damn sure. Mycorrhizal fungi both sequester carbon, as they decompose, and play a part in releasing carbon dioxide back into the atmosphere. Adding charcoal to soil helps to incorporate phosphorus and potassium; it is part of the terra preta soils of the Amazon, soils with enhanced fertility and levels of nutrients such as nitrogen, phosphorus, potassium and calcium due to the incorporation of organic material, manure and potsherds over millennia. These have remained fertile for over 2,000 years, thanks to human intervention – it’s rare that we can say that. Soil is the third largest carbon sink in the world, after the oceans and deep fossil fuel deposits. But there is a danger that soils will become carbon sources as soil organisms get stimulated, by the knock-on effects of climate change, to break down organic matter more quickly. Nitrous oxide is nearly 300 times as powerful a greenhouse gas as carbon dioxide and one of its main sources is inorganic fertilisers and manures. Soil is important. An annual growth rate of 0.4% in the soil carbon stocks would halt the increase in the carbon dioxide concentration in the atmosphere related to human activities. So a turn away from industrial agriculture and synthetic fertilisers, and a focus on incorporating organic matter in the soil, not ploughing, and letting fungus do its thing, is very much called for). Artists vary in their relationship with materials; mine has always been dialogue-based – I am interested in what materials want to do, how they respond, how they surprise me. I’ve got the best results when I’ve been mindful, when I’ve allowed materials to act rather than trying to force them. This means paying enough attention to let go of a fixed goal and allow something different to emerge. Are materials co-producers? I would say, very often, yes, and certainly when they’re alive. Tsing also mentions the intriguing possibility of the latent commons. The most important factors in determining carbon storage are rainfall and temperature – cold and wet is good. If lots of sugars are exuded into the soil, everything happens too quickly. Pine needles are good as they are slow release. The more diverse the soil ecology, the better. Plant communities are homogenising globally, coming to be dominated by fast-growing species (ruderals) which use lots of resources quickly. This is the opposite to most fungal growing strategies. (interesting that he uses the word strategy, which to me implies some kind of intent). Soils are becoming less fungi-dominated and more homogenous – we need to shift back to natural systems, and soil with more fungi and bacteria. According to my notes, the savannah around Kilimanjaro is dead. 30% of the world’s soils are degraded, and 50% are degrading (this is from the 2015 report The State of the World’s Soils). How does this link? In obvious ways, we want – I want – human communities as well to be less homogenous, not standardised, not dominated by fast actors who can commandeer all the resources. Donna Haraway talks about making kin – encompassing the non-human, down to and beyond the microscopic level – which can provide a way of talking about connection to place. We talked about how complex networks are more stable – although some say they are more unstable because a few dominant individuals create the connections. He thinks that on balance greater complexity correlates with greater stability. I love using the word correlate, it makes me feel brainy. Interestingly, bacterial communities are dominated by 500 different species globally; the same with fungi. According to the ecologist Francis Brearley, there are core fungal species that the majority of trees will associate with, plus each tree has its particular species. The 500 dominant species are themselves dominated by a smaller proportion – or rather, within the 500 dominant species is a smaller number of even more dominant species. A bit like the 20/80 hypothesis (that in any group, 20 % of the people do 80% of the work/activity). Nice to know that fungi act like social clubs! Mutual aid in nature – plant/fungal co-development – co productions – different forms of mutual aid. Anna Tsing writes about neighbourliness, political listening, social relations across difference. A half-remembered saying – if your movement has no conflict, it’s not diverse enough. How does this link to indeterminacy, polyphony, transformative social encounters and sympoiesis versus globalisation, homogeneity, scalability and autopoiesis? Relationship vs individualism? Thinking versus logic? I like the Bohr quote – No, no, you are not thinking, you are just being logical. I haven’t written anything here about solidarity with non-human nature. Here you see the jewels, there you see the eyes. We have nothing to give you but your own freedom. We have no law but the single principle of mutual aid between individuals. We have no government but the single principle of free association. Sacrifice might be demanded of the individual, but never compromise: for, though only the society could give security and stability, only the individual, the person, had the power of moral choice – the power of change, the essential function of life. His hands were empty, as they had always been. Mutual aid is the idea that we all have a stake in one another’s liberation, and that when we can act from that interdependence, we can share with one another as equals. Original Zine: Ain’t no PC Gonna Fix it, Baby. 2013. Can I articulate those relations? In the nature of making art how the object asserts itself – has own agency – element of uncertainty, dialogue, refusal within materials – repeat, differ, modify, assess, try again – core to artist production. Added complication of using living materials – can enact refusal, unpredictability – have to be responsive – something about emergence, setting up initial conditions – co-producers as participants – consent from a mushroom? A popular theory proposed by Read postulates that habitat type and the distinct functions of different mycorrhizas help determine the particular symbiosis that will become predominant. In this theory, EcM symbioses evolved in relatively productive ecosystems, such as boreal forests, but in which nutrient cycling could still be limiting. In this scenario, ectomycorrhizas are a somewhat intermediate form, having greater mineralization capacities than arbuscular mycorrhizas and less so than types such as ericoid mycorrhizas. This is supported by several studies, some of which also purport arbuscular mycorrhizas to be the ancestral trait. According to this data, many non-mycorrhizal and other mycorrhizal forms represent evolutionary specializations. As is traditional, I am very behind with this blog. Below is an email I sent to my mentor for this project Fiona MacDonald on 16th October. Thank you so much for your edits of the gathering blurb. I attach the current version. I’ve just put it out to my friends and activist networks – tickets will go on general sale on 24th October. Everyone I’ve mentioned it to says they want to come, so I’m reasonably confident it will sell out. I also wasn’t happy with the way the different mushrooms were mapping onto the elements of the town – houses, barns, stores, power, well, pump. It felt a bit contrived. But the main problem was the floor area that I have available, which is approx 2.6 x 1.6 metres if we use the floor, around 3.1 x 2.1 if we build out into the double height space. And – when I placed some of the growing mycelium on the floor area, I really liked the look of them on a pale plain surface and against the coloured gaffer tape. I don’t want the work to look like a nature display in a gallery, and I think this adds an interesting tension between the “natural” elements and the “synthetic” ones. 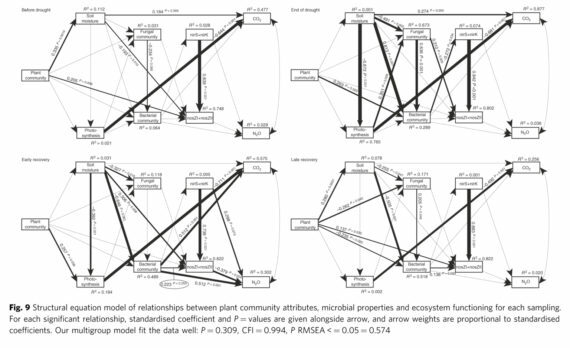 So that also made me rethink diagrammatic aspect, and I went back to a really interesting diagram (see attached) in a paper co-authored by Richard Bardgett, one of the soil scientists that I’ve been talking to, comparing the stability of bacterial and fungal networks under drought (fungal communities are more stable!). It only has nine elements, which is a lot more manageable, and a whole lot of interconnections, which is really pertinent to my whole investigation into mutual benefit within a complex community; one of the things that’s come up repeatedly in my research is that mycorrhizal associations don’t exist in isolation. I can use coloured gaffer or fluorescent pencils for the lines – I’m really interested in the contrast between fluorescent colours and the colours of the fungus. Oh and also – I was looking at a tempera painting and I think the colours and texture of tempera potentially work really well with the fungus. Placing the fungus on a painting also means I should get spores dropping onto the painting. However I’m not sure how will this will work with the relationship lines – but I could use this for some of the fungus that doesn’t make it onto the main installation. However…I don’t actually understand all the terms on the diagram, so I’m currently waiting to hear back from Richard on this. Once I can more accurately understand the diagram, I can work out how the fungal varieties that I’m working with map onto it. Elm oyster – i have some spawn in the fridge, it needs inoculating. Enoki – my tests are only just showing signs of mycelium. I am optimistic that they will fruit in time for the preview. 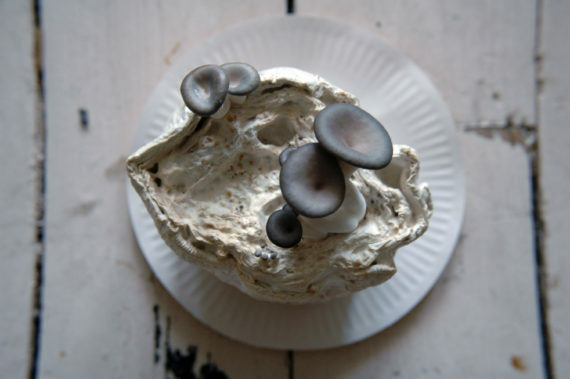 Grey oyster mushrooms – I am setting a new lot off next week, to fruit at the preview. Indian oyster – this is a fast-growing oyster, I plan to inoculate it next week. Pink oysters – as above. Yellow and white oysters – I want them! Adrian Ogden supplies these, says it takes 3 weeks to colonisation, so if they arrive this week there’s just about enough time to get them colonised for the preview (which is 30 days away). NB even if they’re not fruiting the colonised mycelium looks great. King Stropharia – I have some spawn in the fridge, will give it a go. Adrian says this is very hard to fruit indoors – but if I get good colonisation then that is enough. I’ve also ordered some from him. And if they do fruit, they’ll look fantastic. Morels – these have contaminated with lots of green mould, apart from a small amount that I put in a tumbler, which has got good colonisation. Adrian says morels aren’t able to fight off competitors in the way that other fungus can, and so growing them in non-sterile conditions is highly likely to result in contamination. It’s disappointing though, as these are the only actual mycorrhizal fungus that I’m growing. however all is not lost on the mycorrhizal front – I’m going to plant some of the non-contaminated morel with some saplings, in the hope that it’s the start of a beautiful long-term relationship. P. stipticus is still glowing away in my bedroom. I am going to grow on some more. One of the most important things mycorrhizal fungus does is make phosphorus available to plants, so I am thinking of using P. stipticus to represent phosphorus. Like phosphorus, p. stipticus gives off light because of a chemical reaction. Shaggy inkcap – this is now fully colonised. There is just about enough time to set a new batch off and have it colonised in time for the show. However I am a bit unsure as to how suitable it is – apparently they don’t last long, and deliquesce – which sounds great but messy. White elf – I have some spawn in the fridge – need to do a bit of research on growing time. So there are 13 different types of mushroom…there is some redundancy in the system! But I note that I have gone way overboard, and I could have made things a lot easier for myself by just concentrating on one species – or at any rate, fewer than 13! This is partly a consequence of wanting to find out which mushroooms would fruit in time, partly because I had the idea of making paint from the spores, and partly my own tendency to get overexcited and take on too much. But I’m happy with the soil ecology diagram as a basis for the installation. It brings it back to earth and soil. A final (?) element is to make knitted sleeves for some of the fungus. There are logistical things to consider – will the copper oxidise? (Possibly not, as I’m using enameled copper, and a test piece that’s been sat in water for a week isn’t showing any signs of verdigris). Will this add contaminants? (I’ve got isopropyl alcohol aerosols to spray them with, and am planning to do a knitted and non-knitted batch for each fungus). Will I get any knitted up before I do the inoculation? (Not at this rate, because…)…what am I actually knitting??? The idea is that each sleeve relates either to a particular element, or to the idea of mutual aid. I am looking for small quotes that I can knit into the fabric. Because I’m using wire and cotton, I think the words are more likely to look like beautiful abstract calligraphy than actual words. I haven’t yet found a really good quote, so I am going to go back to some notes I took from The Dispossessed a couple of years ago (I definitely want Ursula to be in the piece somehow!) I’ll also have another trawl through Always Coming Home. I feel reasonably confident I can knit nine sleeves. I did some test knitting last week and the copper wire at first knitted up perfectly and then started missing stitches, so I may have to hand select every row – slow but doable. I’ve also bought some blue and green copper wire -very exciting, and appropriate to the spectrum lines for phosphorus. I also mentioned Gass’s idea of building out over the double height space. I think this could really work – it means that as people go down the stairs, they will get a real eye-level view of that part of the installation. I’ve talked to Gass some more about it, and the possibility of allowing people to walk around three sides and finding a way to block off the edge so that they can’t fall off. This would also make a dark space available below where I can put the P. stipticus/phosphorus. Shaggy Inkcap – shock it. Get info from Ann Miller and Adrian Ogden. Big question – can I hold fruiting back by delaying shock? Or will this be detrimental? So, I’m glad I’ve reduced the plan from 50 elements to 9. However I still have too many species on the go – would welcome some input into this, or guidance on prioritisation – I’m pretty confident that not all the mushrooms I grow will make it into the show, on one hand I think it’s good to have some redundancy and backup in case things don’t work, on the other I am making a LOT of work for myself..if I inoculate six lots on Monday, that is basically the whole day. And I do want to have some more knitting to show you on Wednesday! PS where I’m growing on straw, some of the straw has germinated and I’m getting a mini-meadow in a bag!